"We’re not the next Silicon Valley — we’re the first Hudson Valley." As part of the #TechForAll series in the Poughkeepsie Journal, I wrote an op-ed piece about why it's silly to compare the Hudson Valley's rising tech scene with Silicon Valley. The HV has so much about it that makes it special — why would we try to be someplace else? "Ten years from now, I won’t be surprised if the Hudson Valley is a byword for a startup culture with a particular ethos — small farms, slow food, good neighbors and thoughtful technology." "Silicon Valley is a great place to work if you want to build yet another social network that needs to attract 100 million users in a year to be successful. For those who’d rather spend their time being good stewards of a particular niche, the Hudson Valley is a good place to be." An in-depth look at the region's gig economy. Special report by the Poughkeepsie Journal that takes a look at the region's gig economy. 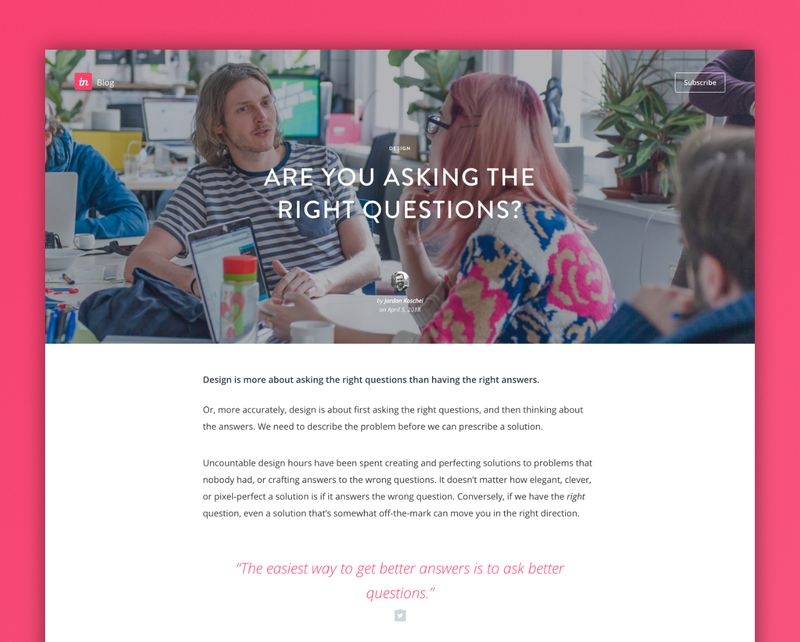 InVision Blog Post — Are You Asking the Right Questions? I wrote a piece for InVision on how designers can ask better questions, gain clearer insights, and use mental models to identify the right problems.